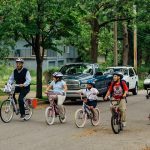 FreeWheels for Kids empowers kids with bikes, and Bike Club, funded by the Health Forward Foundation, most perfectly embodies that vision for our students. Bike Clubs are student-led and give kids the chance to define for themselves what they want for their community, and the skills to make their ideas a reality. 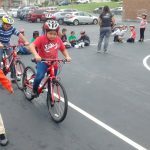 In just one short school year, we’ve started Bike Clubs at five schools and community centers in Kansas City, Kan., giving those students the chance to improve their community, help others, and of course, to ride bikes together. At the end of the school year, we had our first-ever Leaders’ Summit at Clinton Lake, with representatives from three bike clubs in attendance. We rode our bikes, practiced at a skills park (they have bike see-saws?! ), roasted marshmallows, learned how to pitch (and pack) tents and reflected on the year behind us. We talked about the things we like and dislike about Bike Club (and neighborhoods), our visions for the neighborhoods where the students ride, ideas for the future and even some pretty sophisticated theories of urbanism. I expected to hear students complain about traffic and angry motorists, but their optimism surprised me. Despite incidents with motorists, everyone there agreed that things have gotten better in just one year, and that what problems still exist have easy, straightforward solutions. Students noted that we get more waves of recognition than honks of annoyance out on the road now! Of course, every time I think kids are going to stick to taking on little problems (like riding their bikes in a safe way so motorists know to expect them or putting up bike route signage or even biking as a signal to others that the streets are safe), they jump ahead into much more serious territory. As we keep working over the summer with some of our students and prepare for 2014-2015, I can’t wait to see how our students continue to think big and act even bigger in making their neighborhoods better places to live.